Frame To Table 2018. 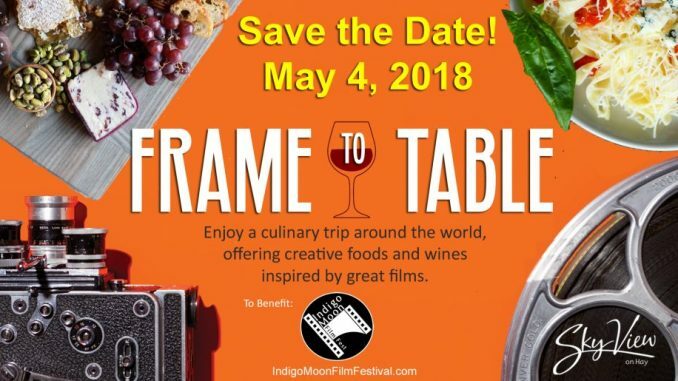 Source: GroundSwell Pictures, Inc.
GroundSwell Pictures is pleased to announce the second-annual “Frame To Table” fundraiser, scheduled for May 4, 2018, starting at 7pm, in SkyView on Hay, Fayetteville, North Carolina. Frame to Table is a culinary trip around the world, offering creative foods and wines inspired by great films. At the “Cinema Paradiso” table, you can sample a variety of delectable Italian bites. Then, travel to “Slumdog Millionaire” for mouthwatering Indian cuisine, and on to Greece for goodies at the “Zorba the Greek” table. Enjoy foods and films from six countries along with an open bar and fabulous desserts. A Table Raffle will end the night as guests can win exciting prizes including food, wine, entertainment, and travel. Proceeds from this fundraiser will benefit Indigo Moon Film Festival. The films and foods are a “taste of what is to come” when Indigo Moon Film Festival brings national and international films back to screens in Historic Downtown Fayetteville the weekend of October 12-14, 2018. Watch for film festival details at IndigoMoonFilmFestival.com.